Sunday February 1 2015 is World Hijab Day, with almost 140 different countries taking part in the action to promote awareness, understanding and a peaceful world through experience. 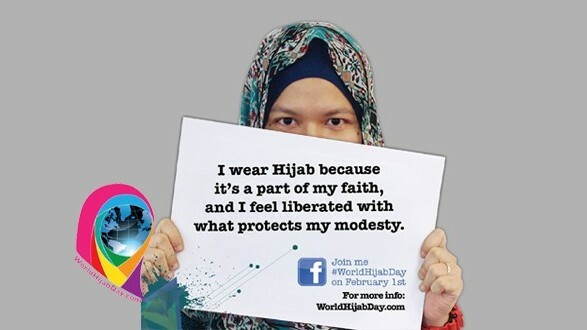 With the slogan “Before you judge, cover up for a day”, WHD can be compared to the saying to “walk a day in someone elses shoes,” and invites both Muslims and non-Muslims alike to take a day to wear a hijab covering, so as to understand what the everyday life is like to those wearing a hijab, and hopefully add a layer of depth to the many debates surrounding the garment. 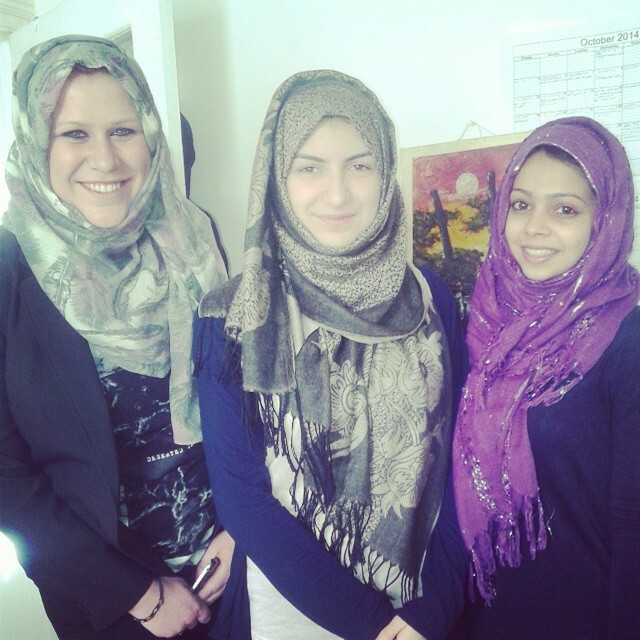 The River journalists Priyanka Mogul and Bauke Schram decided to take on the challenge, and met up with president of the KU AhlulBayt Islamic Society, Amina, who helped them wrap their hijabs for the day, generously inviting them into her home. Priyanka Mogul and Bauke Schram ready to have their Hijabs on. “For me, I think it’s good to get to see different perspectives about hijabs as well, especially from a non-Muslim point of view,” Amina tells Priyanka and Bauke while fastening Priyanka’s scarf with a needle to make it stay and taking a step back to check on her work. “Oh you guys look so different!” she exclaims excitedly. The two journalism students have each got a scarf wrapped meticulously around their heads, and somehow they both look different yet the same, and their eyes in particular, stand out compared to before. Perhaps this is why so many women wearing a hijab seem to have such deep eyes, full of a culture, tradition and experiences different to the rest of us. Priyanka and Bauke listening to Amina telling them about Hijabs. But is this difference scary? Why is it something as small as a scarf, a head garment really, not much different from a hat or a particular piece of jewellery, provokes such extreme reactions and responses from around the world? We all have pieces of clothes which represent us, our countries and our traditions, but somehow the hijab is different. The perhaps strongest debate surrounding women in hijab appear to be the feminist issue. Is it fair to force women to cover up simply because they belong to a certain religion or culture? Women should be free to choose for themselves and should be allowed to wear and show what they prefer without being judged for it. This is one of the core arguments in Western feminism, and one which is important. However, what is important to remember is the role of culture and tradition in this. A hijab is not just a garment used to oppress women, or to make them hide themselves. It is a symbol of belonging and religion to millions of people. If it is wrong to judge someone for their traditions, then it is wrong to judge them for choosing to wear a hijab, is it not? “The point of why we wear the hijab is because of modesty, so it’s recommended to wear clothes that don’t grab too much attention,” Amina told Bauke and Priyanka before leaving her home, all wrapped up and looking decidedly more like they belong to a different demographic. Bauke, Amina and Priyanka ready to head outside. Spending a full day at university with classes and seeing people they know, Bauke and Priyanka went off with mixed expectations. However, the biggest worry they had were the people they knew. “I didn’t experience anyone looking at me in a strange way or in a negative way. But I’m not so surprised by that because that’s what I expected. The one difference I did find was that somehow I felt safer from the lingering gaze of men on the streets. I’m tempted to say that men treated me with somewhat greater levels of respect – at least that’s what it felt like,” Priyanka says after her day. So in the end, what is the issue around women wearing hijab? Is it one of faith, of feminism or one of simply allowing people to be who they want to be? Those of us who do not have to wear a hijab for more than a day, are we privileged? Certainly now that we have a whole day where we can wear one without stepping on anyone’s toes. Both Bauke and Priyanka are feminists, but they don’t understand this issue around hijabs. “Feminism encourages women to be able to wear whatever they want and wear it proudly. So why then do we challenge those women who choose to wear the hijab?” Priyanka questions at the end of her day. In association with World Hijab Day, the Islamic society have a stall in the main corridor at Penrhyn Road campus on Monday February 2, where they will tell everyone who are interested more about hijab, give away free scarfs, and even offer to help put them on. Let’s all try walking in someone else’s headscarves for a day.